We wanted to wear something casual but not sloppy, something that said "I'm ready to meet new people" but not "Do you mind if I sleep on your couch?" So, of course, we pulled out our new Half Sneakers from Mihara Yasuhiro. We like to think of these puppies, fresh from a highly regarded Japanese designer who has done his own line for Puma, as the Harvey Dent/Two-Face of sneakers. Or, if you prefer, the reverse-mullet of footwear. From the front, they appear to be a regular pair of low-top Chuck Taylors. But from the back, they look like a sort of futuristic silver bowling shoe. They're unified by a continuous rubber sole and normal laces. We've never seen a shoe change so drastically at the arch. 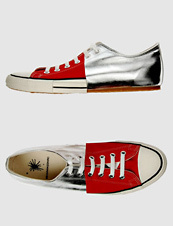 Why would you want to wear a silver/red/future/vintage/bowling shoe/sneaker hybrid?